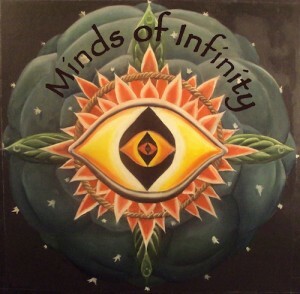 Minds of Infinity was formed in 2012 by members Luke Utzman, and Michael Swanson, over an intense guitar and chanting session that birthed an open ended expedition into the depths of the potential of the mind, and the medium of music. Drawing on influences of electronic and space rock music, Minds of Infinity, seeks to meld these psychedelic sounds with the grounded and connected sounds of world music, and ethnic instruments. Free your mind and come along a musical journey with us! We are just like you… Cover art by Destry Ford, mastering by Crossroads Recording, Rapid City, South Dakota (now closed). MP3 Download | FLAC Download | WAV Download · Download count: 14,190. This album reminds me a lot of the Robert Musso album “Absolute Music” and the Bill Laswell group Transonic, really great stuff. A beautiful album full of various musical instruments rhythm and great guitar licks. Great work! Much more varied than a lot of downtempo. The space rock guitar isn’t something many electronic artists dare to go near, but it blends really well with the rest of the layers in your tunes. Keep it up! A bit upbeat for downtempo … Love it! this is pure awesomeness. great blend of modern and old psychedelia. very well crafted as well! Hey just want to give a shout to those who uploaded this on youtube, you guys really rock, thank you very much, im loving this ektoplazm community! Love and respect echoing through eternity! One of the best recordings I’ve heard in a very long time, it’s so good I had to buy a hard copy from Luke and Mike…can’t wait to see the next release. Very happy with having released it on ektoplazm! what a great community, thanks to all those who enjoyed! Great Album, really like the guitar work, blends in very well, hope to hear more of you! Any chance to see you at european festivals? Que album te mandaste, man! muy bueno!!! increíble, me encanta la vibra. Gracias por compartir hermano! How is that possible there is NOT a button Like or + or tweet so I caaaaan share amazing music colored and peaceful and powerful !! How can we fix this so the rest of the world can listen and be amazed ? Please help me with that issue. Matter of life and death maaan !! I know how to do it, it so simpleee !! Lots of people could hear this album ! Kenny, thanks for your comment im so glad your excited about it! Why no + and like buttons? Because I am a marketing failure thats why! Is there a way to fix this? If there is i would love to somehow imbed links to our bandcamp, facebook, and youtube channels…. Im not sure how this can be implimented, but you have my permission to share the links, or help me in whatever way you can!! any futher tips or ways you know of to help spread it, please do let me know, email me at [email protected] Ive thought of trying to start a street team, except on the internet…. Minds of infinity: Aravialus coming soon, stay tuned. You just have to copy the code they gave you. ONCE you copy your own link on the page I gave you. when you have the code, you just need to copy that in the page. Go to the page code then copy paste. I share with you how I see it. You lost me Kenny can u please email me at [email protected] and I’ll get a conversation going with you about these buttons? Thanks. Just recently finished a new track for new album and I think it is our best yet so stay tuned! Basilisk, I really enjoy what you have achieved with this platform. I see how people around me use it and appreciate it. I think this is a wonderful way to put music in the ears of everyone on this planet ! If you could just consider this : I’m a serial knowledge consumer (music is knowledge by the way !). Like you said most sites have easy sharing buttons. I appreciate it so much. Why ? Because with them I can share like super easy and super fast the wonderful things I experienced. Like most albums on this platform. Unfortunately, people are impatient on the internet. Today you can easily find something that will change your life and have it in minutes on your computer. Like your project !! I mean there are so much things on the internet. why would I share something that I need to select then click then select copy then go on facebook and twitter and LinkedIn and select three times copy. Dios mio. I’m lazy pleaaaase !! One or two click is just enough ! Imagine all those lazy people like me who appreciate put don’t take the time to share music because they are damn lazy ! Buttons = more attention on the project, for listeners, more artists, and growing opportunities ! Okay I think we got really far here. The best to you two ! This is really good music. Thanks ! Excellent! Ca me fait juste trop du bien ce mélange entre du chill et avec des solos de rock psyché bien acides :D je suis convaincu!